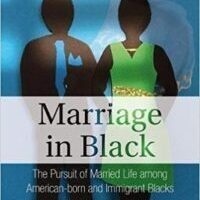 Marriage in Black: The Pursuit of Married Life Among American-born and Immigrant Blacks offers a progressive perspective on black marriage that rejects talk of black relationship “pathology” in order to provide an understanding of enduring black marriage that is richly lived. The authors offer an in-depth investigation of details and contexts of black married life and seek to empower black married couples whose intimate relationships run contrary to common―but often inaccurate―stereotypes. Husbands and wives tell their stories, from how they met, to how they decided to marry, to what their life is like five years after the wedding and beyond. Katrina Bell McDonald is an Associate Professor of Sociology at Johns Hopkins University, Co-director of the Center for Africana Studies at the Johns Hopkins University, and an Associate of the Hopkins Population Center. Books will be available for purchase at the book signing after the event.